Photo right: The Rev. 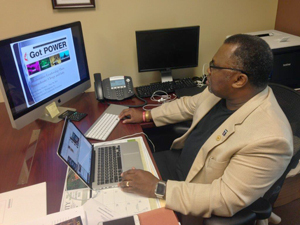 Timothy Thompson examines a power point as he discusses clergy and laity collaboration for church planting and revitalization. Photo by Tamica Smith Jeuitt. In his ministry, the Rev. Timothy Thompson often refers to lighthearted sayings from the woman he affectionately calls, Mama Lily. "My great-grandmother, Mama Lily, would say, 'A person needs to be healthy, so they don't have ugly babies.' Therefore, churches need to be healthy, so they can produce strong healthy faith communities, with good DNA," Thompson humorously stated. He serves as assistant to the bishop and director of faith community formation for the Mississippi Annual Conference. During the 2015 annual conference session, he led a joint presentation revealing a conference-wide focus on creating 20 faith communities (five churches per year) by the year 2020 and church revitalization. "It is not a campaign. It's not a program. It is living out the New Testament mandate and that is to make disciples of Jesus Christ for the transformation of the world. We believe the most effective way to do that is by starting new faith communities and strengthening existing churches," explained Thompson. He stressed that faith communities do not necessarily refer to structures, but instead a bottom-line purpose. That is building the kingdom of God. "That means the new faith communities will take different forms. We may help existing congregations to birth churches out of themselves. There may be new worship services that may have grown to the extent that they want to branch out and start a new faith community. Some churches may want to act as new missionaries and send 20 to 30 people across town or to another city to plant a new congregation," explained Thompson. A major factor in starting a new faith community are the leaders, also called church planters, according to Thompson. He and his team have already identified five planters. Based on that number, the assessment process and the Day of Discernment events, they were able to set the goal of 20 new faith communities by 2020. "Once we target church planters and they go through the assessment process, then we know how many pools of church planters we have. That gives us an indicator of how many churches we can plant." The names of the church planters will be shared later. Regarding the assessment process conducted on them, Thompson said resources from PATH 1, an agency of The United Methodist Church Discipleship Ministries, were used. He's also working with the Mississippi Conference office of spiritual leadership. His message at the annual conference session came after the release of economist Don House's report on The United Methodist Church. House said the church was in crisis and a continuing decline in worship attendance would lead to the collapse of the denomination. He warned that the church had 15 years to reverse the decline if it is to have a sustainable future. The new structure of the Mississippi Conference adopted at the 2014 session, aligns with some of House's suggestions for a turnaround. That includes forming faith communities and church revitalization. Thompson added that it costs about $400,000 to start a new faith community and $550,000 to revitalize an existing faith community (with a three to five year commitment from that community). "If God gives us enough bricks and enough days, we're going to build His Kingdom," said Thompson who believes the Mississippi Conference and The United Methodist Church will deliver healthy results. Thompson's home church is New Zion UMC located in Crystal Springs, Mississippi where his Mama Lily was a life-long member. She passed away just before he accepted his call to preach in the early 1980s. Sensing the call for church planting and church revitalization? Roughly 80 attendees of the 2015 Session of the Mississippi Annual Conference responded via text message that they had a desire for planting and revitalizing churches within the conference. Now, the faith community formation committee is counting on seeing these people and others exploring the call at a one day event, in a rare venue for church -- a bar, Hal and Mal's, located in downtown Jackson, Mississippi. The concept -- meeting people where they are -- was the reason for choosing this meeting space. Mississippi Conference clergy and lay will gather at Hal and Mal's to learn about leadership gifts for revitalization, church planting strategies and models of revitalization on Thursday, August 20, 2015, at 10 a.m. and 3 p.m. The Rev. William Chaney, representing Path 1 for the Southeastern Jurisdiction and the Rev. Dr. Michelle Holmes Chaney, director of Phemi Leadership (a revitalization strategist), will lead the discussions. They are husband and wife. For more information about the day of discovery and discernment, people can text their name and email address to 662-368-2252. 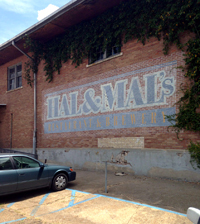 Hal and Mal's popular for its weekly live-concerts and restaurant, is located at 200 Commerce Street.